• Superior Benefits Over Live Foods: Specially developed for the needs of most carnivorous fish, without the potential for parasite or bacteria transfer common with live foods. Offers balanced nutrition with all the necessary ingredients your pet desires. • Extremely Palatable: Developed after extensive study and analysis of the sense of sight, smell and taste of numerous carnivorous fish. The inclusion of key ingredients allow us to produce a food most larger carnivorous fish eagerly attack. • An X-Large Pellet Big Fish Love: A porous pellet that softens quickly by rapidly absorbing water. This nugget sized pellet will satisfy the hunger of your monster fish by retaining its shape. Best of all, when used as directed, it will never cloud or negatively impact your pet's water. • Natural Beauty They Desire: Most monster fish come from the natural environments high in UV which promotes vibrant coloration. 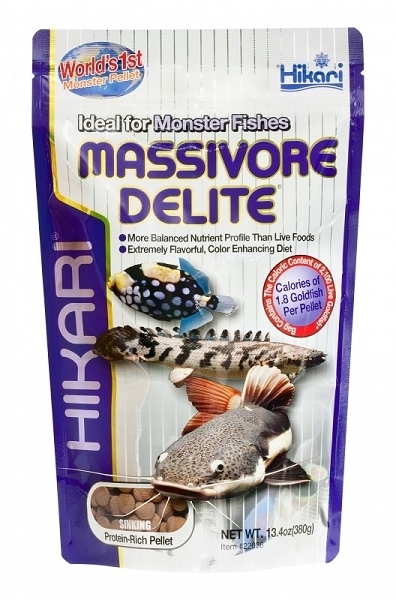 Using modern bio-technology and the highest grade of carotenoids, Massivore Delite® can help your fish develop their true coloration in UV deficient aquatic environments. Now your fish can look as good as you expect, always! • Developed, produced and packaged in our facilities so we can be assured you'll always get the ®Hikari quality you expect!